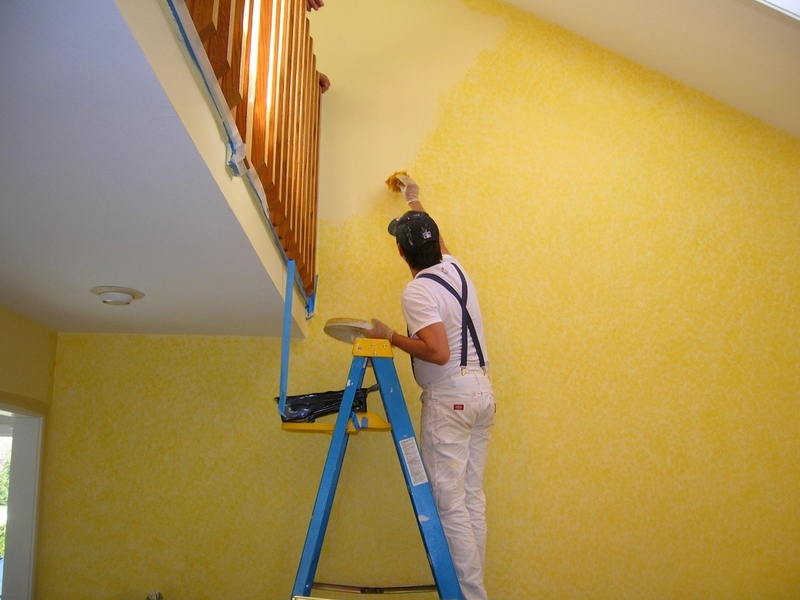 When painting interior house, you may need to pay a lot attention to paint it perfect. Below are some tips summarized by me. Hope they will help. Roll the full height of the wall. Lap marks are those ugly stripes caused by uneven layers of paint buildup. They occur when you roll over paint that’s already partly dry. (In warm, dry conditions, latex paint can begin to stiffen in less than a minute!) The key to avoiding lap marks is to maintain a “wet edge,” so each stroke of your roller overlaps the previous stroke before the paint can begin to dry. To maintain a wet edge, start near a corner and run the roller up and down the full height of the wall, moving over slightly with each stroke. Move backward where necessary to even out thick spots or runs. Don’t let the roller become nearly dry; reload it often so that it’s always at least half loaded. Keep the open side of the roller frame facing the area that’s already painted. That puts less pressure on the open side of the roller, so you’re less likely to leave paint ridges. Mix paint in a large bucket. Once paint is dry, you can’t just pull the tape off the trim. Paint forms a film between the wall and the tape, and removing the tape tears pieces of dried paint off the wall. So before pulling off the tape, cut it loose. Wait for the paint to completely dry, at least 24 hours, then use a sharp utility knife or box cutter knife to slice through the film. Start in an inconspicuous area to make sure the paint is hard enough to slice cleanly. If you cut the paint while it’s still gummy, you’ll make a mess. As you cut the paint, pull up the tape at a 45-degree angle. Paint color may vary slightly from one can to the next. If you have to open a new can in the middle of a wall, the difference may be noticeable. Mixing the paints together eliminates the problem. It’s best to estimate the amount of paint you’ll need and mix it in a 5-gallon bucket (a process called “boxing”). When coverage is difficult to estimate, add more rather than less. You can always pour the leftover back into cans. For large jobs, use the bucket and a roller screen rather than a roller tray. It’s much faster to load your roller with the screen than to use a roller pan. Simply dunk the roller into the paint bucket, then roll it along the screen until it stops dripping. Prime and texture wall. Pros usually follow a certain order when painting a room. They paint the trim first, then the ceiling, then the walls. That’s because it’s easier (and faster) to tape off the trim than to tape off the walls. And you certainly don’t want to tape them both off! Primer seals the patch so paint won’t sink in and look dull. To match texture, prime with a roller, feathering out the edges. Choose a nap thickness to match the surrounding wall texture (a 3/8-in. nap roller for smooth walls; 1/2-in. for textured). Wipe on the cleaner in a circular motion using a lint-free cloth or abrasive pad. Start at the bottom and work up. After the surface is clean, fill in any nicks and holes, then sand them smooth before painting. The cleaners are available at paint stores and home centers. Be sure to wear rubber gloves and eye protection. Corners and areas next to trim that are painted only with a brush have a notice- ably different texture than the surrounding paint. To ensure the finished texture will be consistent in these areas, brush on the paint, then immediately roll it out before the paint dries. Use a 3-in. roller with a nap that’s the same thickness as the roller used for the rest of the wall. Roll as close as you can without bumping the opposite wall or slopping paint onto the trim. Finish brushing on the paint and rolling it out in one area before moving on to the next section. You can’t cover large areas like ceilings, extra-tall walls or stairwells in single, continuous strokes, so the best way to minimize lap marks on these areas is to feather out the paint along the edges that you can’t keep wet. The thinner, feathered coat of paint will avoid the buildup that causes the lap mark. One coat of paint usually won’t hide the underlying color and sheen on trim. And if you don’t sand the surface smooth between coats, the finish may have a grainy texture. For a smooth finish, sand the trim before applying each coat of paint. Server responsed at: 04/22/2019 5 a.m.